Yeah I know , but you know what I mean ,if it had been anyway else or any other situation I would have left the shot and tried to get into a better position. Interests:Varminting, hiding in bushes and watching the wildlife, aviation. No idea what made me do it but at the last minute this evening I put the .22 back and took the .17hmr instead. Glad I did. 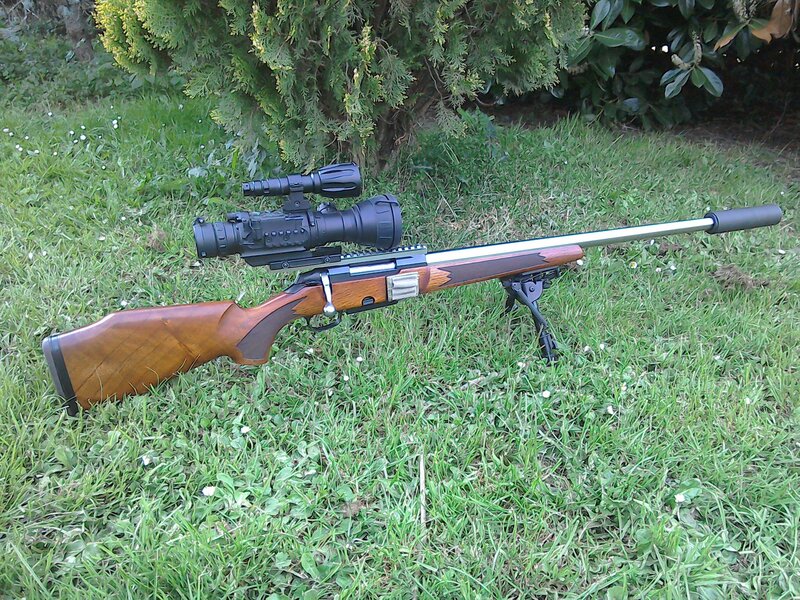 Bagged some rabbits and was walking back to the car to move on, stopping every few yards to peek through the NV007. Earlier I'd seen a dog fox heading toward the paddocks where the lambs are. It was too far for a shot so I made sure he saw me, he made a wiiiiide detour but as he headed where I was walking I was in his way. Lost sight of him, assumed he'd buggered off, but he tried again and I spotted him from the car. Popped the rifle onto the bonnet, lit up the IR and there he was in the field with just head and shoulders visible and facing me. As soon as I drove off he'd be into the lambs. 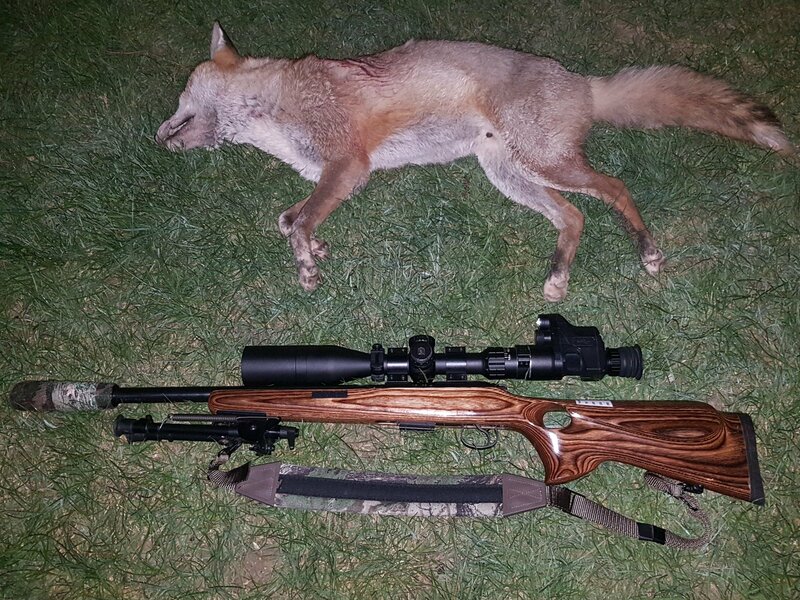 I'd always said I'd only shoot a fox with the .17 up to 100 yards and although judging range is tricky in the dark I reckoned he was close enough so took the shot. Pacing it out afterwards it was exactly 100 yards plus a size 9 boot. Beginners luck. Entry is barely visble on the bib but internally it did what it was supposed to do and there's a sizeable exit wound between the shoulder blades. He dropped on the spot. I wouldn't have taken the shot off my (2) sticks but with the bipod on the bonnet I was steady enough. Any doubts I had about the .17 for foxes have subsided a bit but I wouldn't be happy beyond (say) 120 yards. First thing tomorrow I'm putting in my variation for .308! 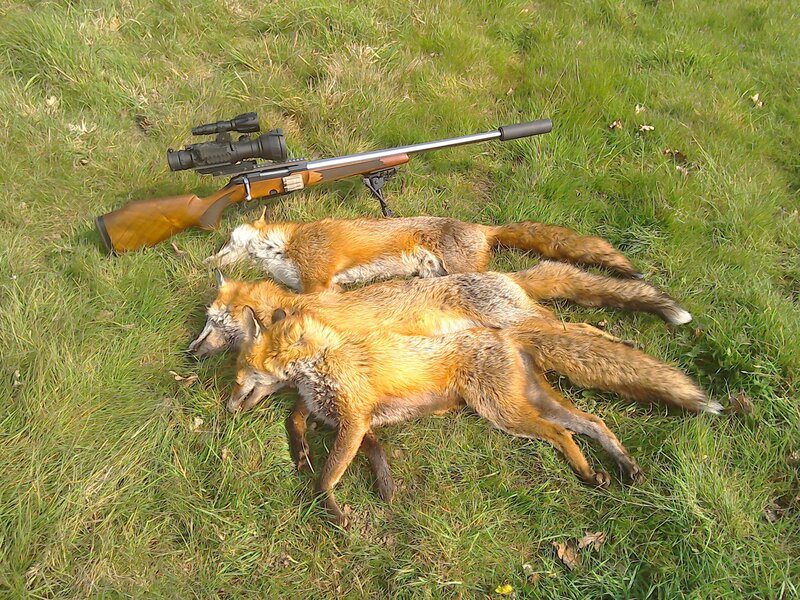 Well done mate, nice shot,good that it ended well😃, funny you should bring up this post as i was shooting the farm this post is about last night, also for rabbits and took the 17fireball with drone aboard, I shot 3 dog foxes, 245 / 190 / 125 yds, the 245yarder was a side on heart shot, straight down all 4 legs up in air for a few secs then ran about 10 yds before dropping dead, paced him 255😃. The one sitting at 190,i called in from about 300 and suddenly he decided to sit down and look at me,hit him same place as yours,didn't even twitch, 125 couple kicks and dead, brilliant little round the fireball, almost as good as when it was a 17rem😃. the fox talley was up on this farm a couple of weeks ago at 45 for year, down a bit from normal considering there seemed to be never ending foxes at one point, but last night kicked off the new year well with 4, as my lad had another dog fox off the high seat he was on , while I had fun a few fields away. Nice to hear the lapwings on the setaside where I was parked last night, they usually nest on there, so removing those foxes will help them a bit😃, they've just got the magpies,crows, gulls, buzzards,kites and dog walkers to watch out for now, aswell as the next fox along!! Speaking of which, met one yesterday on my drive in. She was crossing the bridleway but had come straight across a recently drilled field and was about to go through another. I politely explained where she could and could not go but she would have none of it. Apparently it was okay because she's been doing it for years. I'm seeing more of them since a new estate was built next to the land. People think that because it's unfenced it's their right to use it. Let's see how keen they are a few hours after walking through a load of glypho soaked weeds. Went to deal with some more rabbits,on a wheat field last night on a different farm, and the 17 fireball performed well again, couldn't believe it, another 3 foxes turned up, 2 more dogs and a barren vixen. Interests:All types of shooting, motorcycling. Great result Bob👍 tidy set up you have there. What batteries are you using to feed the drone? Cheers martin 👍 , yes it's a great bit of kit the drone, i've got an extended rail on the 204 and fireball so can swap it between rifle's easily, just a quick rezero😃. The batteries I use are Panasonic Lithium cr123A, i buy them in bulk, cheaper that way😃. Cheers Bob, I think I will do the same buy in bulk. I have tried a few different rechargeable batteries in my 15x drone and they don't last long. I put an extended rail on my 595 Tikka, perfect eye relief for the drone. We are leaving them alone this time of year un less we know it's a dog fox for certain or a vixen taking lambs and we then want to know we're the earth is if possible. we also have two shoots one is fully keepered and on that shoot we haven't stopped but we recon to know every earth on the shoot or we're to look for the earths. two points the keepers been told no one can dig an earth now with dogs ? the other point this estate was arginally set up by a rich hunting family and the keeper wasn't allowed to control foxs part of the year as the hunting was more important. Some times things should be left alone!